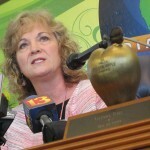 In what she called a “referendum” on the last four years of Indiana’s overhaul, Democrat Glenda Ritz captured 52 percent of the vote to make Republican Tony Bennett a one-term state superintendent. Ritz says Bennett took Indiana “in the wrong direction” when it came to quality classroom instruction, an argument that resonated with educators dissatisfied with high stakes testing and teacher evaluations. But her election mandate hasn’t translated into an easy first year in office. Ritz has the backing of the Indiana State Teachers Association, which mobilized local teachers unions to support her in the 2012 election. Ritz has clashed repeatedly with Republican Gov. Mike Pence and the 10 appointed members of the State Board of Education. In August, Pence announced the creation of a new education agency, the Center for Education and Career Innovation, to align the state’s workforce development efforts. Ritz says she was left out of the loop. Then, in October, the rest of the State Board sent a letter to Republican legislative leaders asking for help calculating A-F letter grades, accusing the Department of Education of dragging its feet. Ritz sued the other Board members, accusing them of violating Indiana’s Open Door Law. That suit was dismissed on procedural grounds. Ritz says blame for the ongoing dispute lies with CECI, the new home for State Board staff. 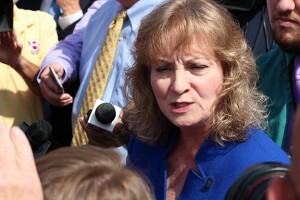 Ritz is in the difficult position of having to implement the policies of her predecessor, with which she mostly disagrees. She’d like to dismantle the current A-F grading system, which she says has a detrimental effect on communities whose schools have been labeled as “failing.” Ritz is also against the expansion of school vouchers. But she’s acknowledged getting her policies enacted without Democrats in the statehouse will be an uphill battle. Republican legislative leaders said if the situation between the superintendent and the State Board didn’t improve, they’d consider stripping Ritz of her power to chair the Board – and they tried. During the 2015 “education session,” legislators made restructuring the State Board a priority. Despite failed attempts to take Ritz’s chair position away, they were able to pass legislation that would allow the board to elect its own chair beginning in 2017, at the end of Ritz’s first term. At the end of the 2015 session, Ritz hinted to a run for higher office, citing a desire for new state leadership. She officially announced in June that she will seek the Democratic nomination for governor of Indiana. With A New Superintendent, Which Policies Hang In The Balance? The unexpected election result came in the middle of huge education policy transitions in the state. The 23-member ISTEP+ Review Panel will study alternatives to ISTEP+ and make recommendations for a shorter, simpler-to-administer test by December. State superintendent Glenda Ritz announced updates to her legislative agenda Tuesday. Yorktown Community Schools Superintendent Jennifer McCormick filed paperwork this week to seek the superintendent of public instruction office as a Republican. Our stories that received the most attention online, on social media and over the air. Lawmakers revealed more details surrounding education legislation they intend to introduce during the 2016 session, beginning in January.